High Finesse is a German optics company that makes high-quality spectrometers and wavelength meters. I’ve written a python interface to their provided wlmData driver in order to grab spectrum data off a LSA UV Vis 2, however, it is likely to work with other spectrometers and wavelength meters that use the same library. Unfortunately, at this time High Finesse only provides windows drivers. The project will soon be available on pypi as pyHighFinesse. High Finesse provides a dynamic library called wlmData.dll, which is installed to the system32 directory. They also provide a C header called wlmData.h which contains additional constants useful to the interface such as error codes and options. The LSA is a GUI that also a server process that communicates with the instrument. The python interface communicates and shares memory with the LSA through the dynamic library. 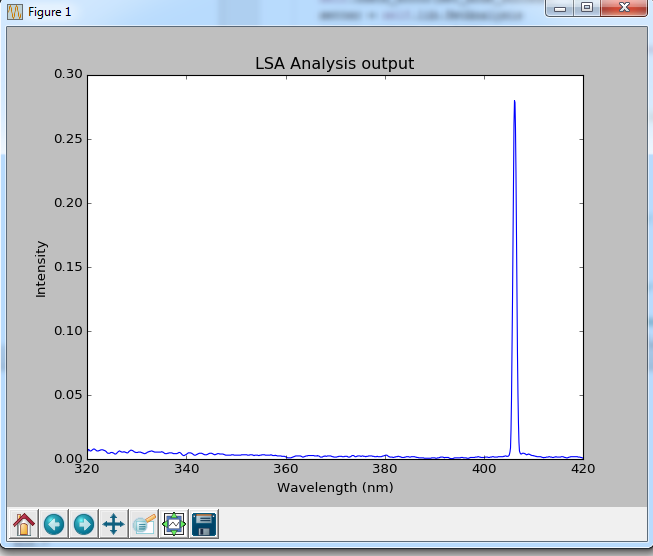 The python interface needs to start up the LSA in order to get data off the spectrometer. The header file contains a lot of useful information about error codes, return types and options. In future, the function return type could be used to automatically populate the ctypes restype value, but for now only error codes and options are red in. Header values are added as attributes to the Spectrometer object. The values of the integer constants are one of three things: a number, a string representing a previously declared integer constant, or an expression adding previous constants and numbers. Since there is no built-in function to check whether a string can be parsed as an integer, this parsing is done as a nested try/catch block. First the string is parsed as an int; if that fails, it is split around the plus sign. (The header expressions currently only contain additions). Then, there must be a second integer check, and if that fails, it assumes that the string is a value that python has previously parsed in. Errors should be added to their corresponding sets for future error checking. Constants starting with Err occur when measurement values or settings are read from the LSA; constants starting with ResErr occur when settings are changed in the LSA. The list of ResErr errors contains an error 0 for NoErr to confirm that the setting was changed, this error is purposely excluded fro m the list of errors. Finally, the wavelength ranges are also defined in the header, however these do not appear to correlate with the actual values in the LSA. For the moment, this is hard-coded for the observed values. If you have a High Finesse device other than an LSA, please let me know what these ranges are for you. The functions in the WLM dynamic library will either return a value, such as a short, long or double, or an address in memory. The return type must be specified in order for the output to be read correctly. The parameters for wide and precise spectrometer analysis appear to be reversed. It is likely that other High Finesse devices also exhibit odd behavior, however this module was currently tested with an LSA UV Vis 2. If this module results in odd behavior on your device, please let me know by submitting an issue on github.